Before my wedding stuff takes over another thread, I thought I'd post some details here. Decided to have it at our home (Cliff May) because nowhere I wanted to have it was worth the money (Hall of State, Filter Building at White Rock, etc). Right now we're spending most of our time getting the outside ready. Yard's in pretty good shape (but our st. augustine is mostly brown and patchy...too late to do anything about it I'm afraid) but still painting. March was unusually cold and rainy so we got really behind. It's basically just going to be a swanky party...lots of food and drinks. My brother, a professional brewer, is making two different kinds of beer for us. 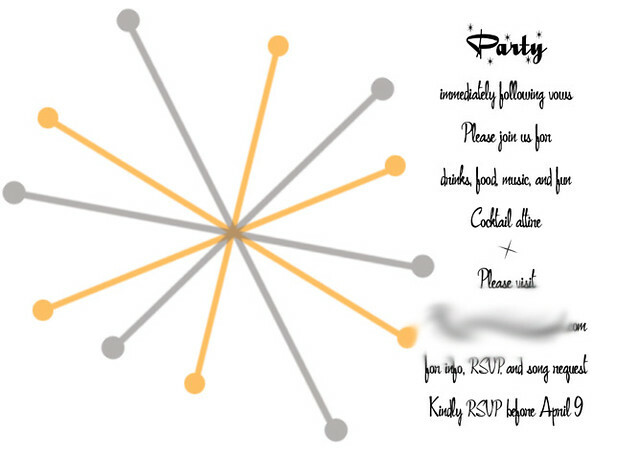 Same goes for the invitations--nothing I liked for the right price so I made my own. Please don't be too critical--I'm not a designer or know much about...is it still called desktop publishing? The originals look much better--I converted to jpg and resized to fit it on here--doesn't look very sharp. I printed the invitations on card stock w/ a color laser printer. Front and back. I just don't see the point in wasting all that paper for inner envelopes, rsvp cards, etc. The aqua is off in this picture for some reason--it's actually the same color as the rest of the designs. I'll link to pictures when I have them! Sharp-looking stationery--it melds perfectly well with your home and, no doubt, will match your mod-awesome wedding too! 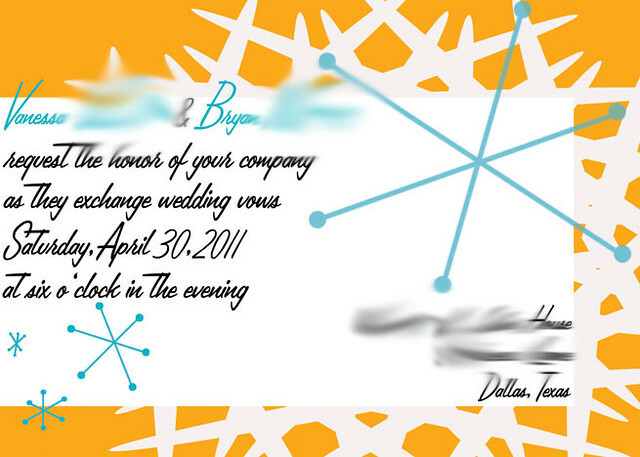 Only problem is your address is blurred out...so I'm not sure where I should be at 6 pm on April 30th. That'd be a long way to travel to crash a wedding! Got the in--I'm really happy with them. I didn't need custom coasters in particular but I couldn't find any decent looking disposable coasters. 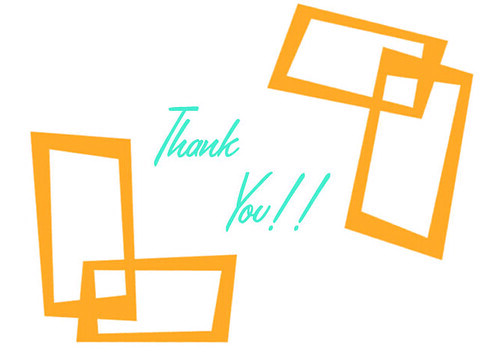 Also got the in for the thank you cards and a bit disappointed becuase the pattern is so light the envelope almost looks like a regular one. I guess that's the problem with ordering online. 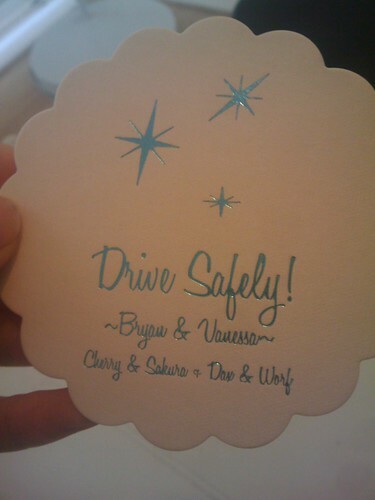 The "Azure" ones I used for the invitations looked really good though. I used stamps for the invitations and stamps for the thank you cards (minus Selena and Celia Cruz). I didn't really see any other stamps I liked--especially the wedding ones. Love the invitations! Those are the colors in my new home (orange in the LR, and aqua in the kitchen)!! Good taste, mate. Nice design and really like the fonts. Did you get the image off an invitation site? I was looking at retro party invitations for when we have our homes 'coming out' party after it's all painted, decorated, etc. 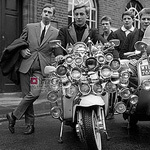 Found some great retro ones much like yours. some people are creative, some are not. you are. your invitations look great! can't wait to see the photos and have a wonderful wedding day. I was at a wedding last weekend, and the wedding cake was made from tiers of cup cakes. I guess this is not too uncommon today, but it was new to me and I thought it was brilliant. So ... what are you going to do about a modern cake? Addendum: The google ad on this page also quite amazing. As soon as I posted this, it showed three ads for wedding cakes, including one for a cupcake tower. No cake. I'm not a big fan of cake and neither is my fiance. We're having bite-sized desserts. Including baklava! It's not a traditional wedding at all. No bridal party/groomsmen, no bouquet, no aisle, etc, etc. And thanks Joe and Sky! It went well, overall. Very stressful in the morning b/c that's when I found out his mother had run the dishwasher the night before with liquid dish soap. Water all over and the inside was sudtastic. I had to do at least 3 more loads of dishes (we used real dishes for the party) so panic mode set in. Took me hours to get everything cleaned up. So really put us behind and we weren't able to go out and do wedding portraits. 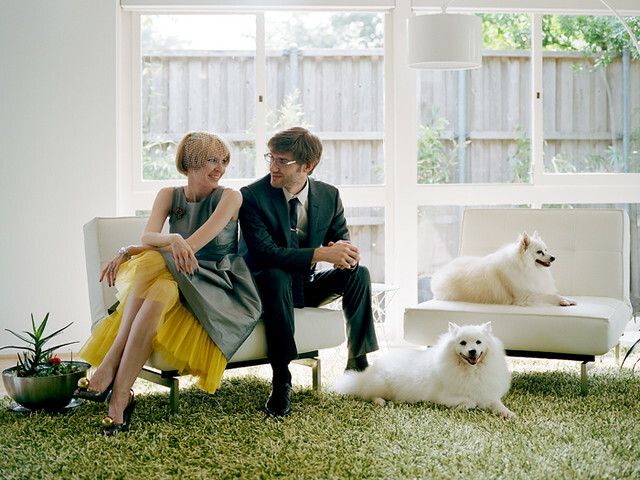 So the photographer took some pictures of us at our house and a few in the park nearby. Was very very disappointed about that but nothing I can do now about it. Right before the ceremony was to start, it started pouring. We waited about 30 mins and then just decided to have it inside. As soon as we both kissed, it stopped raining so we were able to have the party outside...thank goodness--55 people in a 1,300 sf house is a bit much...and hot. Haha--no smooshing of any desserts. The baklava was great though--made with my dad's honey. congrats Van, looks like a unique event. 55 people in your home, wow!